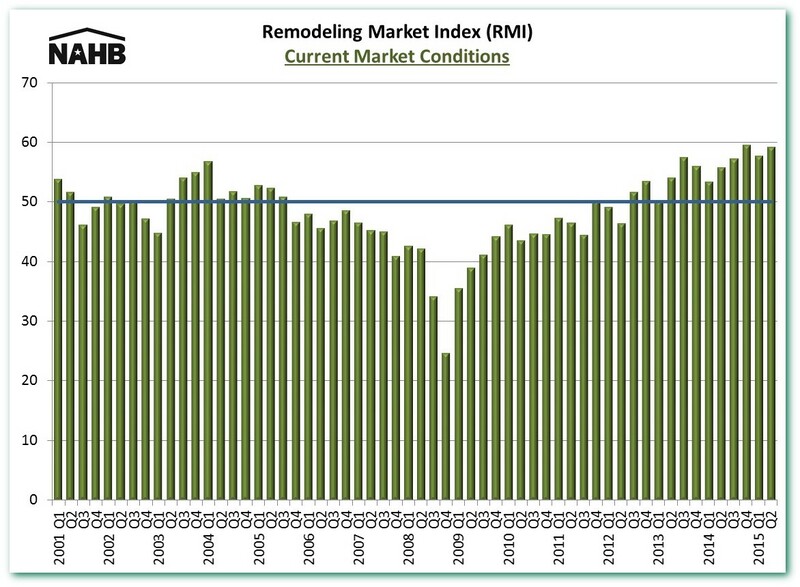 In the second quarter, NAHB’s Remodeling Market Index (RMI) rebounded two points to 59 (after having slipped slightly from 60 to 57 in the first quarter). An RMI above 50 indicates that more remodelers report market activity is higher (compared to the prior quarter) than report it is lower. 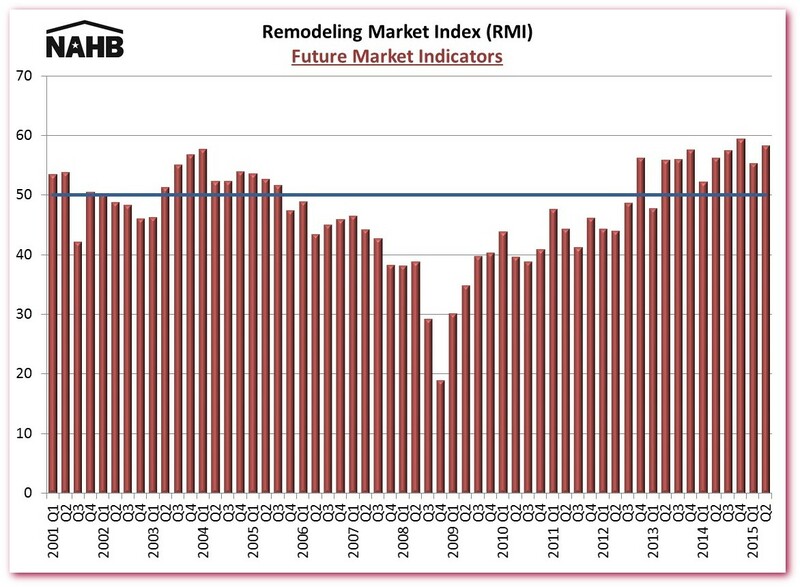 The RMI, which averages ratings of current remodeling with indicators of future activity, has been over 50 for nine consecutive quarters. This has been true for both current conditions and indicators of future activity. Moreover, all of the current conditions major subcomponents remained above 50 in the second quarter. Major additions gained steam in the second quarter of 2015, rising to 57 from 54. Rising from 56 in the previous quarter to 61, smaller remodeling jobs continued to show strength. Overall, the current market conditions of the RMI rose one point to 59 this quarter. Meanwhile, the future indicators index rose to 58 from 55 in the previous quarter. Two of its subcomponents—calls for bids, and appointments for proposals—gained five or more points from the previous quarter’s reading while the amount of work committed for the next three months and the backlog of jobs remained steady and above the break-even point of 50. The rebound in the RMI is consistent with other signs of strength in the housing industry, particularly new and existing home sales.